Managing your money and budgeting can be a daunting task, even if you're a spreadsheet ninja. Corralling accounts, watching your money move, and keeping track of everything can be tough, but there are personal finance tools that make the job much easier. Here are some of the best personal finance tools, perfect for keeping track of your finances. Earlier in the week, we asked you which personal finance tools you thought were the best, easiest, and most feature-rich when it comes to managing multiple accounts, helping you stick to your budget, and giving you a clear picture of your financial health. You offered up way more than we have room to feature here, but here are the five that stood out above the rest. Ah, Mint. Mint is free, web-based, and was one of the first free, web-based personal finance tools to plug in to all of your banks, investments, retirement funds, credit cards, and other financial accounts to quickly give you a complete picture of your financial health. The service is still free, and still great, and supports more banks in more places (although the service still only works in the United States and Canada. If all that Mint did was let you see all of your money, where it's moving, and what your account balances were at any time, that would be enough, but it does more than that. Mint also lets you draw up a household budget and warns you if you're not sticking to it, see how much you're spending on what types of purchases or utilities, set up savings goals, and actually stick to them. Mint doesn't touch your money itself—it just uses read-only access to show you everything—but it does suggest financial products to you that might save you money in the long run, like lower-interest credit cards or higher-interest savings accounts. Those of you who nominated Mint praised its mobile apps for iOS, Android, and Windows Phone, and noted its pedigree—the fact that the service is owned by Intuit, the makers of Quicken. We've highlighted Mint in the past as well, noting it can make your tax season easier, and make budgeting realistic and easy to stick to. You can read more in its nomination thread here. You Need a Budget has a large, active, and passionate community, and for good reason. YNAB is only partially about its budgeting software, although that's what you're paying for when you buy it—you also get access to financial literacy classes, tutorials, a community of users, budgeting tools and tricks, and more. The app itself is available for Windows and OS X, with mobile versions for iOS and Android. Since the app runs locally, you have access to your financial information offline if you need it, and YNAB still imports transactions from your banks, credit cards, retirement funds, and other accounts to deliver a single-pane view of your financial health. The app guides you through setting financial goals and sticking to them, helps you reconcile accounts when your numbers feel off, and walks you through the budgeting process in a simple, understandable way. You can try YNAB for free for a month, but after that you'll need to drop $60 for the app (one license is good for all your systems), and the mobile apps are free. Those of you who praised YNAB (in multiple nominations, to boot!) all noted that it was one of the first apps you were able to really get into the groove of using, and many of you had financial institutions that other apps didn't support. You also praised YNAB's budgeting features, which teach you to stop living paycheck to paycheck and find ways to save money. We've highlighted YNAB in the past as well—the last time we asked you about the best personal finance tools, it was your most popular pick, and we mentioned when its mobile apps went free. If YNAB's price tag has you seeing red, don't worry—it's frequently on sale for half-price or less. You can even get it during Steam sales (yes, it's available through Steam) at a huge discount from time to time. Read more in the nomination thread here and here. Those of you who praised GnuCash highlighted its ability to import Quicken files (QIF) and OFX files (Open Financial Exchange) that many banks use when you ask to download your transaction history. You also mentioned that with the help of Dropbox (or better yet, an encrypted cloud storage service), you can access your finances on any computer anywhere, completely for free. Read more in the nomination thread here. Available for OS X, Windows, and Linux, MoneyDance is a robust personal finance tool that supports online banking (so you can download transactions from your bank and manage your investments in the application) and budgeting. It can connect to hundreds of financial institutions out of the box, and you can import transactions on your own if you choose. The account register works like a balanced checkbook, and always shows you where your money is going. You can also set up payment schedules for recurring transactions so you know when big transactions are about to take place, and track your investments using the investment module. If you want access on the go, there's a free mobile app for iOS devices (and one of you noted that the Handybank app for Android, for $7, will connect to MoneyDance as well.) The app is available to try for free, but after entering 100 transactions, you'll need to drop $50 on a full license. Those of you who praised MoneyDance highlighted the app's ability to handle multiple types of financial transactions with ease, and the fact that the app can even print checks for you if you need it to. You noted that it syncs seamlessly with banks even though it works as a desktop app, and even reminds you to pay bills when they're due every month. You can read more in the nominations thread here. BudgetSimple is a free budgeting and personal finance tool that focuses squarely on making sure you have a budget that works for you. The tool will analyze your finances and spit out a budget planner that's packed with suggestions for where you can save money, trim your spending, and increase your savings, all with the goal that you don't have to live paycheck to paycheck anymore. BudgetSimple aims to make the process as easy and approachable as possible, and promises that an hour with the tool will give you a better understanding of where your money is going. You can enter your expenses manually if you want, or connect it with your bank to auto-link accounts. Once you have your budget and you're all set up, it's a matter of keeping your finances in check, and the tool helps you with that as well. BudgetSimple is a webapp and completely free, but if you want mobile apps or the option to fully link your bank accounts, you'll need a $5/mo premium account. Those of you who nominated BudgetSimple praised its simplicity and its focus on creating a no-nonsense, sustainable, and sensible budget that you can live by. You noted it's a straightforward tool, and it does a lot of things that some of the other contenders in our roundup charge money for—and the graphs and statistics do a great job of explaining where your money is going. You can read more in its nomination thread here. This week's honorable mention goes out to Personal Capital, a web-based tool for managing your investments and assets. It's a little less oriented towards individuals looking to budget for the future or wrangle their household expenses and more towards people looking to make sense of their retirement accounts and plan for the future. It does track all of your spending and income though, and it's a great financial management tool overall. The team behind it likens it to having a digital financial advisor. Want to make the case for your personal favorite, even if it wasn't included in the list? Remember, the top five are based on your most popular nominations from the call for contenders thread from earlier in the week. Don't just complain about the top five, let us know what your preferred alternative is—and make your case for it—in the discussions below. The Hive Five is based on reader nominations. 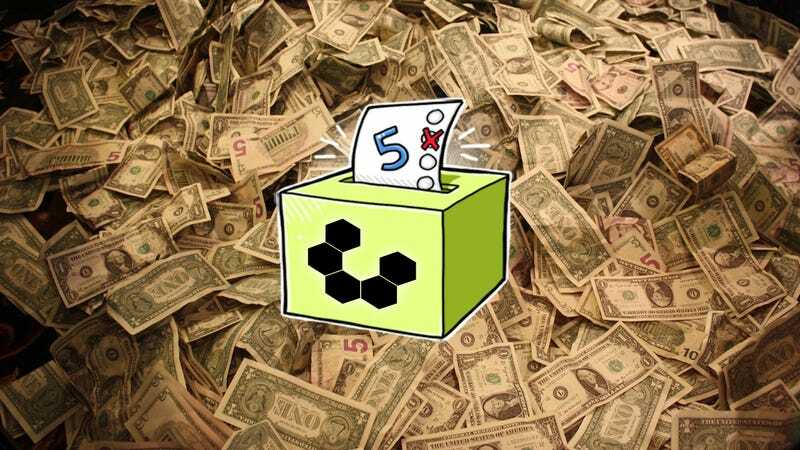 As with most Hive Five posts, if your favorite was left out, it didn't get the nominations required in the call for contenders post to make the top five. We understand it's a bit of a popularity contest. Have a suggestion for the Hive Five? Send us an email at tips+hivefive@lifehacker.com! Title photo by Nick Ares.